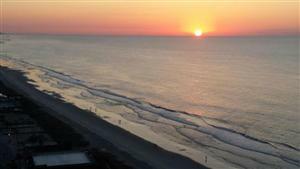 Tower ocean view studios feature a wonderful view of the beach and the Grand Strand coastline. These units feature a queen size bed, a queen sofa bed, two adolescent bunk beds as well as a fully equipped kitchenette, full bath, and a private balcony. Amenities located inside the Tower include a sauna, exercise room, laundry and a deli that features some hearty subs! Also venture over to the lazy river complex, outdoor pools, tennis courts, putting green, playground or the indoor pool. One of the best values on the Beach! Be sure to stop by The Quarterdeck Beach Bar & Grill this summer for delicious food, cold drinks and live entertainment! Head to the ground floor of the tower to enjoy some of the best pizza the Grand Strand has to offer at The Galley Food & Spirits.